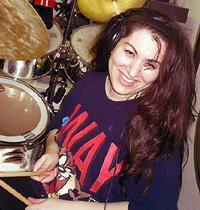 Who is Hurricane Artist Victim #1: Sam Amazyan? Sam Amazyan is a musican and a composer. His greatest joy in life is creating and performing music that touches and enriches people's lives. Through his musical career, which started when he was 15, Sam Amazyan performed and experimented with a wide variety of musical styles (from classical, to jazz, to rock, to heavy metal, to European, to Middle Eastern music). He has played lead guitar in different bands and always sought out by vocalists and band leaders. 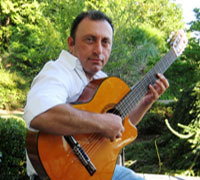 He has played in bands for audiences in Armenia, Russia, Europe, Australia, Brazil, and the USA. Today, Sam Amazyan is enjoying performing nationwide at retirement and assisted living homes, helping people through his beautiful music with sounds of world music. 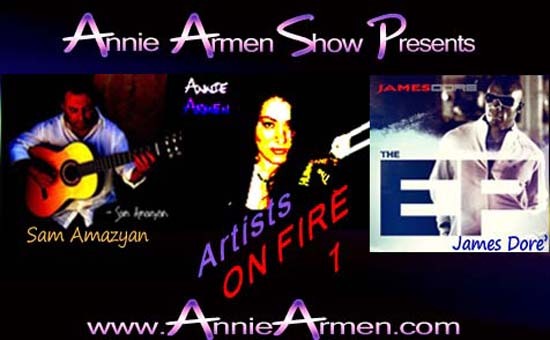 For many of our loyal fans and supporters, you have seen the Annie Armen Show travel through the world of causes, to the world of business, with occasional music programs featuring celebrity artists such as Chico Vega's Legendary Drifters, Rahmlee, Rob Mullins, and more. Throughout the years, many of you have shared observations such as, "Annie, there is something so unique about your program. Your show is all heart, all soul, you're on fire, your message is pure in seeking truth and solutions, and your music production rocks. When you speak, you always communicate with heart, humor, wisdom, rhythm and infectious energy. You are a drummer of words, etc..."
As a Communications Artist today, which includes the percussionist, drummer and singer side of me, how can I possibly turn my head the other way and not pay my respect to TRUE ARTISTS ON FIRE from the world of music? Artists who are dedicated to their craft with all heart and soul; artists who push forward no matter how extenuating their circumstances; artists who have embraced resistance, in many cases ... lack of support from family and loved ones, judgment from folks in suits, while staying true and loyal to their dream. Artists who walk to the beat of SHOW MUST GO ON, the very beat taught in business. Because I have experienced and live BOTH sides of the world -- music and business -- today, I am blessed with this rare privilege to be a soulful voice for our genuine artists who are ON FIRE, artists who do not know the meaning of quit. We will talk about their lessons learned from failures, and their forward successes as a result thereof. Out of all the series and programs I have produced and aired throughout the years since television, this particular series -- Artists ON FIRE -- IS representative of my heart and soul, authentic to my very core and being! What you will hear, what you will experience, will be nothing short of heart, love, soul, bringing out hidden treasures and details, often and unfortunately overlooked by many. Question for WHY Annie Armen Readers? 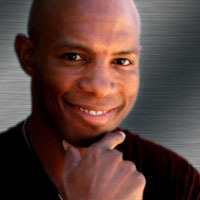 Are you a musician, artist applying your anointed gifts and abilities in business and in life? Do you have an inspiring story to share? That interview was a lot of fun Annie Armen! Such a great honor to be a part of your show and to be a friend! What you are doing is so important to music and the world at large. Thank you! Michael, thanks again for all of your hard work man! I appreciate you immensely! Listen, in case you don't already know, This lady is amazing! She is a dynamic speaker who has interviewed some of the most renown authors, health experts and motivational speakers in the nation including E.R. Haas, and Zig Ziglar and the list goes on and on. Make sure you check out her new series! Outstanding! GOD BLESS YOU for acknowledging Michael... His help has been tremendous in this endeavor!!! !